Bicycle Day commemorates the occasion of April 19, 1943 When Swiss chemist Albert Hofmann I intentionally ingested 0.25 milligrams (250 micrograms) of The psychedelic drug (or entheogen) lysergic acid diethylamide (LSD) in order to determine the properties of LSD. Hofmann had first synthesized LSD on November 16, 1938in the Sandoz (now Novartis) laboratories in Basel, Switzerland. English novelist and short story writer James Graham “J. G.” Ballard sadly died 19 April 2009 from Prostate Cancer. He was Born 15 November 1930 and raised in the Shanghai International Settlement, an area under foreign control where people “lived an American style of life”. He was sent to the Cathedral School, the Anglican Holy Trinity Church near the Bund, Shanghai. After the outbreak of the Second Sino-Japanese War, Ballard’s family were forced to evacuate their suburban home temporarily and rent a house in central Shanghai to avoid the shells fired by Chinese and Japanese forces. It has been supposed that Ballard’s exposure to the atrocities of war at an impressionable age explains the apocalyptic and violent nature of much of his fiction.In late 1945, after the end of the war, his mother returned to Britain with Ballard and his sister on the SS Arawa. They lived in the outskirts of Plymouth, and he attended The Leys School in Cambridge. He won an essay prize whilst at the school but did not contribute to the school magazine. After a couple of years his mother and sister returned to China, rejoining Ballard’s father, leaving Ballard to live with his grandparents when not boarding at school. In 1949 he went on to study medicine at King’s College, Cambridge, with the intention of becoming a psychiatrist. At university, Ballard was writing avant-garde fiction heavily influenced by psychoanalysis and surrealist painters. At this time, he wanted to become a writer as well as pursue a medical career. In May 1951, when Ballard was in his second year at Cambridge, his short story “The Violent Noon”, a Hemingwayesque pastiche written to please the contest’s jury, won a crime story competition and was published in the student newspaper Varsity. Encouraged by the publication of his story and realising that clinical medicine would not leave him time to write, Ballard abandoned his medical studies, and enrolled at Queen Mary College to read English Literature. However, he was asked to leave at the end of the year. Ballard then worked as a copywriter for an advertising agency. and as an encyclopaedia salesman. He kept writing short fiction but found it impossible to get published. In spring 1954 Ballard joined the Royal Air Force and was sent to the Royal Canadian Air Force flight-training base in Moose Jaw, Saskatchewan, Canada. There he discovered science fiction in American magazines. While in the RAF, he also wrote his first science fiction story, “Passport to Eternity”, as a pastiche and summary of the American science fiction he had read. The story did not see publication until 1962. Ballard left the RAF in 1955 after thirteen months and returned to England. In 1955 he married Helen Mary Matthews and settled in Chiswick, the first of their three children being born the following year. He made his science fiction debut in 1956 with two short stories, “Escapement” and “Prima Belladonna”, published in the December 1956 issues of New Worlds and Science Fantasy respectively. The editor of New Worlds, Edward J. Carnell, would remain an important supporter of Ballard’s writing and would publish nearly all of his early stories. From 1958 Ballard worked as assistant editor on the scientific journal Chemistry and Industry. His interest in art led to his involvement in the emerging Pop Art movement, and in the late fifties he exhibited a number of collages that represented his ideas for a new kind of novel. Ballard’s avant-garde inclinations did not sit comfortably in the science fiction mainstream of that time, which held attitudes he considered philistine. Briefly attending the 1957 Science Fiction Convention in London, Ballard left disillusioned and demoralised and did not write another story for a year. By the late 1960s, however, he had become an editor of the avant-garde Ambit magazine, which was more in keeping with his aesthetic ideals. He was also a prominent member of the New Wave movement in science fiction. His best-known books are Crash (1973), which was adapted into a (rather strange) film by David Cronenberg, and the semi-autobiographical Empire of the Sun (1984), which was awarded the James Tait Black Memorial Prize. 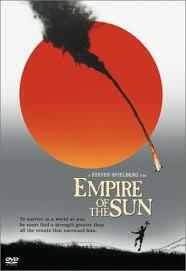 Empire of the Sun is Based on Ballard’s boyhood in the Shanghai International Settlement and internment by the Japanese Imperial Army during the Second World War, and recounts the story of a young British boy, Jaime Graham, who lives with his parents in Shanghai. After the Pearl Harbor attack, the Japanese occupy the Shanghai International Settlement, and in the following chaos Jim becomes separated from his parents. He spends some time in abandoned mansions, living on remnants of packaged food. Having exhausted the food supplies, he decides to try to surrender to the Japanese Army. After many attempts, he finally succeeds and is interned in the Lunghua Civilian Assembly Center. Although the Japanese are “officially” the enemies, Jim identifies partly with them, both because he adores the pilots with their splendid machines and because he feels that Lunghua is still a comparatively safe place for him. However the food supply also runs short here and Jim barely survives, with people around him starving to death. The camp prisoners are forced upon a march to Nantao, with many dying along the route. However some are saved from starvation by air drops from American Bombers. English author and playwright Dame Daphne du Maurier, Lady Browning DBE sadly passed away aged 81 at her home in Cornwall, on 19 April 1989, which had been the setting for many of her books. Her body was cremated and her ashes scattered at Kilmarth. She was Born 13 May 1907. Many of her works have been adapted into films, including the novels Rebecca (which won the Best Picture Oscar in 1941) and Jamaica Inn and the short stories The Birds and Don’t Look Now. The first three were directed by Alfred Hitchcock, the latter by Nicholas Roeg. she is considered a first-rate storyteller, a mistress of suspense and Her ability to recreate a sense of place is much admired, and her work remains popular worldwide.The novel Rebecca, which has been adapted for stage and screen several times, is generally regarded as her masterpiece. In the U.S. she won the National Book Award for favourite novel of 1938, voted by members of the American Booksellers Association. One of her strongest influences here was Jane Eyre by Charlotte Brontë. Her fascination with the Brontë family is also apparent in The Infernal World of Branwell Brontë, her biography of the troubled elder brother to the Brontë girls. Other significant works include The Scapegoat, The House on the Strand, and The King’s General. The last is set in the middle of thefirst and second English Civil Wars. Though written from the Royalist perspective of her adopted Cornwall, it gives a fairly neutral view of this period of history.Several of her other novels have also been adapted for the screen, including Jamaica Inn, Frenchman’s Creek, Hungry Hill, and My Cousin Rachel (1951). The Hitchcock film The Birds (1963) is based on a treatment of one of her short stories, as is the film Don’t Look Now (1973). Of the films, du Maurier often complained that the only ones she liked were Alfred Hitchcock’s Rebecca and Nicolas Roeg’sDon’t Look Now. Hitchcock’s treatment of Jamaica Inn involved a complete re-write of the ending to accommodate the ego of its star,Charles Laughton. Du Maurier also felt that Olivia de Havilland was wrongly cast as the anti-heroine of My Cousin Rachel. Frenchman’s Creek fared rather better in a lavish Technicolor version released in 1944. Du Maurier later regretted her choice of Alec Guinness as the lead in the film of The Scapegoat, which she partly financed. In 1989, Indian director Pavithran adapted her short story “No Motive” from the collection The Rendezvous and Other Stories (1980) for his critically acclaimed mystery thriller Utharam(Answer).Du Maurier was often categorised as a “romantic novelist” (a term she deplored), though most of her novels, with the notable exception of Frenchman’s Creek, are quite different from the stereotypical format of a Georgette Heyer or a Barbara Cartland novel. Du Maurier’s novels rarely have a happy ending, and her brand of romanticism is often at odds with the sinister overtones and shadows of the paranormal she so favoured. Her writing is similar to the “sensation novels” of Wilkie Collins and others, whom she admired. Du Maurier’s novel Mary Anne (1954) is a fictionalised account of the real-life story of her great-great-grandmother, Mary Anne Clarkenée Thompson (1776–1852). From 1803 to 1808, Mary Anne Clarke was mistress of Frederick Augustus, Duke of York and Albany (1763–1827). He was the “Grand Old Duke of York” of the nursery rhyme, a son of King George III and brother of the later King George IV.The central character of her last novel, Rule Britannia, is an ageing and eccentric actress who was based on Gertrude Lawrence andGladys Cooper (to whom it is dedicated).It was in her short stories that she was able to give free rein to the harrowing and terrifying side of her imagination; “The Birds”, “Don’t Look Now”, “The Apple Tree” and “The Blue Lenses” are exquisitely crafted tales of terror that shocked and surprised her audience in equal measure. English naturalist Charles Robert Darwin, FRS sadly passed away at Down House on 19 April 1882. born in Shrewsbury, Shropshire, England on 12 February 1809 at his family home, The Mount. The fifth of six children of wealthy society doctor and financier Robert Darwin, and Susannah Darwin (née Wedgwood). He was the grandson of Erasmus Darwin on his father’s side, and of Josiah Wedgwood on his mother’s side. The eight-year-old Charles already had a taste for natural history and collecting when he joined the day school run by its preacher in 1817. From September 1818 he joined his older brother Erasmus attending the nearby Anglican Shrewsbury School as a boarder.Darwin spent the summer of 1825 as an apprentice doctor, helping his father treat the poor of Shropshire, before going to the University of Edinburgh Medical School with his brother Erasmus in October 1825. In Darwin’s second year he joined the Plinian Society, a student natural history group whose debates strayed into radical materialism. He assisted Robert Edmond Grant’s investigations of the anatomy and life cycle of marine invertebrates in the Firth of Forth, and on 27 March 1827 presented at the Plinian his own discovery that black spores found in oyster shells were the eggs of a skate leech. Darwin became rather bored by Robert Jameson’s natural history course which covered geology including the debate between Neptunism and Plutonism. He learned classification of plants, and assisted with work on the collections of the University Museum, one of the largest museums in Europe at the time. Charles’ father then sent him to Christ’s College, Cambridge, for a Bachelor of Arts degree as the first step towards becoming an Anglican parson. His cousin William Darwin Fox introduced him to the popular craze for beetle collecting; Darwin pursued this zealously, getting some of his finds published in Stevens’ Illustrations of British entomology. He became a close friend and follower of botany professor John Stevens Henslow and met other leading naturalists who saw scientific work as religious natural theology. Darwin had to stay at Cambridge until June. He studied Paley’s Natural Theology, which made an argument for divine design in nature, explaining adaptation as God acting through laws of nature. He read John Herschel’s new book, which described the highest aim of natural philosophy as understanding such laws through inductive reasoning based on observation, and Alexander von Humboldt’s Personal Narrative of scientific travels. Inspired with “a burning zeal” to contribute, Darwin planned to visit Tenerife with some classmates after graduation to study natural history in the tropics. In preparation, he joined Adam Sedgwick’s geology course, then travelled with him in the summer for a fortnight, in order to map strata in Wales. After a week with student friends at Barmouth, Darwin returned home on 29 August to find a letter from Henslow proposing him as a suitable (if unfinished) gentleman naturalist for a self-funded supernumerary place on HMS Beagle with captain Robert FitzRoy, more as a companion than a mere collector. The ship was to leave in four weeks on an expedition to chart the coastline of South America. the voyage began on 27 December 1831; it lasted almost five years. 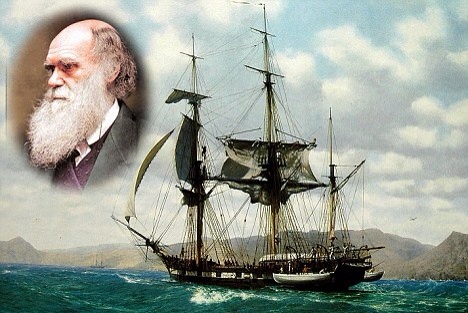 As FitzRoy had intended, Darwin spent most of that time on land investigating geology and making natural history collections, while the Beagle surveyed and charted coasts. He kept careful notes of his observations and theoretical speculations, and at intervals during the voyage his specimens were sent to Cambridge together with letters including a copy of his journal for his family. He had some expertise in geology, beetle collecting and dissecting marine invertebrates.On their first stop ashore at St. Jago, Darwin found that a white band high in the volcanic rock cliffs included seashells. Fitzroy had given him the first volume of Charles Lyell’s Principles of Geology which set out uniformitarian concepts of land slowly rising or falling over immense periods, and Darwin saw things Lyell’s way, theorising and thinking of writing a book on geology. In Brazil Darwin was delighted by the tropical forest, but detested the sight of slavery. At Punta Alta in Patagonia he made a major find of fossil bones of huge extinct mammals in cliffs beside modern seashells, indicating recent extinction with no signs of change in climate or catastrophe. He identified the little known Megatherium by a tooth and its association with bony armour which had at first seemed to him like a giant version of the armour on local armadillos. The finds brought great interest when they reached England. On rides into the interior to explore geology and collect more fossils he gained social, political and anthropological insights into both native and colonial people at a time of revolution, and learnt that two types of rhea had separate but overlapping territories. Further south he saw stepped plains of shingle and seashells as raised beaches showing a series of elevations. He read Lyell’s second volume and accepted its view, but his discoveries and theorising challenged Lyell’s ideas of smooth continuity and of extinction of species. Darwin also experienced an earthquake in Chile and saw signs that the land had just been raised, including mussel-beds stranded above high tide. High in the Andes he saw seashells, and several fossil trees that had grown on a sand beach. He theorised that as the land rose, oceanic islands sank, and coral reefs round them grew to form atolls. On the geologically new Galápagos Islands Darwin looked for evidence attaching wildlife to an older “centre of creation”, and found mockingbirds allied to those in Chile but differing from island to island. He heard that slight variations in the shape of tortoise shells showed which island they came from. In Australia the marsupial rat-kangaroo and the platypus seemed really unusual. The Beagle investigated how the atolls of the Cocos (Keeling) Islands had formed, and the survey supported Darwin’s theorising. Darwin then moved to London and joined Lyell’s social circle of scientists and experts such as Charles Babbage and writer Harriet Martineau who promoted Malthusianism underlying the controversial Whig Poor Law reforms to stop welfare from causing overpopulation and more poverty. Transmutation was anathema to Anglicans defending social order,but reputable scientists openly discussed the subject and there was wide interest in John Herschel’s letter praising Lyell’s approach as a way to find a natural cause of the origin of new species. Darwin learnt that the Galápagos mockingbirds from different islands were separate species, not just varieties, and what Darwin had thought was a “wren” was also in the finch group. The two rheas were also distinct species. Darwin then started writing about Transmutation of Species, and speculated about the possibility that “one species does change into another” to explain the geographical distribution of living species such as the rheas, and extinct ones such as the strange Macrauchenia which resembled a giant guanaco. Darwin Speculated about lifespan, reproduction, variations in offspring to alter and adapt to different environments using the Galápagos tortoises, mockingbirds and rheas as examples postulating a single evolutionary tree containing common ancestors. While developing this intensive study of transmutation, Darwin became mired in more work. Still rewriting his Journal, he took on editing and publishing the expert reports on his collections, and with Henslow’s help obtained a Treasury grant of £1,000 to sponsor this multi-volume Zoology of the Voyage of H.M.S. Beagle, he also planned books on geology.Sadly all this work took it’s toll on Darwin’s health so he took a break in the countryside in Staffordshire where he met his future wife Emma Wedgewood and also formed a new & important theory” regarding the earthworms role in soil formation which Darwin presented at the Geological Society and Darwin became Secretary of the Geological Society. Despite the grind of writing and editing the Beagle reports, Darwin made remarkable progress on transmutation. In an attempt to improve his chronic ill health, Darwin visited Malvern spa and benefited from hydrotherapy. After eight years of work on barnacles (Cirripedia), Darwin’s theory helped him to find “homologies” showing that slightly changed body parts served different functions to meet new conditions This earned him the Royal Society’s Royal Medal, and it made his reputation as a biologist & realised that divergence in the character of descendants could be explained by them becoming adapted to diversified places in the economy of nature.By the start of 1856, Darwin was investigating whether eggs and seeds could survive travelacross seawater to spread species across oceans.By the start of 1856, Darwin was investigating whether eggs and seeds could survive travel across seawater to spread species across oceans. Darwin began work on a “big book on species” entitled Natural Selection and also presented a thesis On the Tendency of Species to form Varieties; and on the Perpetuation of Varieties and Species by Natural Means of Selection to the Linnean Society. At first There was little immediate attention to this announcement of the theory & Despite suffering from ill health he was getting constant encouragement from his scientific friends. Upon it’s publication On the Origin of Species proved unexpectedly popular,In the book, Darwin set out “one long argument” of detailed observations, inferences and consideration of anticipated objections, and states that many more individuals of each species are born than can possibly survive so there is a recurring struggle for existence, it follows that any being, if it changes in any manner helpful to itself, will have a better chance of surviving, and thus be naturally selected. From the strong principle of inheritance, any selected variety will tend to propagate its new and modified form. He put a strong case for common descent, but avoided the then controversial term “evolution”, The book aroused international interest, although there was less controversy than had greeted the popular Vestiges of the Natural History of Creation,The Church of England’s response was mixed. Darwin’s old Cambridge tutors Sedgwick and Henslow dismissed the ideas, but liberal clergymen interpreted natural selection as an instrument of God’s design. Though Darwin’s illness kept him away from the public debates, he eagerly scrutinised the scientific response, commenting on press cuttings, reviews, articles, satires and caricatures, and corresponded on it with colleagues worldwide. Darwin had only said “Light will be thrown on the origin of man”. Despite repeated bouts of illness during the last years of his life, Darwin’s work continued. Having published On the Origin of Species as an abstract of his theory, he pressed on with experiments, research, and writing of his “big book”. He covered human descent from earlier animals including evolution of society and of mental abilities, as well as explaining decorative beauty in wildlife and diversifying into innovative plant studies.Enquiries about insect pollination led in 1861 to novel studies of wild orchids, showing adaptation of their flowers to attract specific moths to each species and ensure cross fertilisation. In 1862 Fertilisation of Orchids gave his first detailed demonstration of the power of natural selection to explain complex ecological relationships, making testable predictions. As his health declined, he lay on his sickbed in a room filled with inventive experiments to trace the movements of climbing plants. In 1882 he was diagnosed with what was called “angina pectoris” which then meant coronary thrombosis and disease of the heart. At the time of his death, the physicians diagnosed anginal attacks”, and “heart-failure”. His last words were to his family, telling Emma “I am not the least afraid of death – Remember what a good wife you have been to me – Tell all my children to remember how good they have been to me”, then while she rested, he repeatedly told Henrietta and Francis “It’s almost worth while to be sick to be nursed by you”. He had expected to be buried in St Mary’s churchyard at Downe, but at the request of Darwin’s colleagues, after public and parliamentary petitioning, William Spottiswoode (President of the Royal Society) arranged for Darwin to be buried in Westminster Abbey, close to John Herschel and Isaac Newton.Darwin had convinced most scientists that evolution as descent with modification was correct, and he was regarded as a great scientist who had revolutionised ideas. Though few agreed with his view that “natural selection has been the main but not the exclusive means of modification, he was honoured in June 1909 by more than 400 officials and scientists from across the world who met in Cambridge to commemorate his centenary and the fiftieth anniversary of On the Origin of Species. During this period, which has been called “the eclipse of Darwinism”, scientists proposed various alternative evolutionary mechanisms which proved untenable. The development of the modern evolutionary synthesis from the 1930s to the 1950s, incorporating natural selection with population genetics and Mendelian genetics, brought broad scientific consensus that natural selection was the basic mechanism of evolution. This synthesis set the frame of reference for modern debates and refinements of the theory. English poet George Gordon Byron, 6th Baron Byron, later George Gordon Noel, 6th Baron Byron, FRS sadly passed away 19 April 1824 after developing a violent fever caused by sepsis. Born 22 January 1788. Byron grew up in Aberdeenshire. In 1798, the 10-year-old boy became the 6th Baron Byron of Rochdale and inherited the ancestral home, Newstead Abbey, in Nottinghamshire. His mother Catherine took him to England”. Upon the death of Byron’s mother-in-law Judith Noel, the Hon. Lady Milbanke, in 1822, he changed his surname to “Noel”. He was also sometimes referred to as “Lord Noel Byron”. Lady Byron eventually succeeded to the Baronetcy of Wentworth, becoming “Lady Wentworth”. Byron was educated at Aberdeen Grammar School, and in August 1799 entered the school of Dr. William Glennie, in Dulwich. Until 1801 when he was sent to Harrow until July 1805. And represented the school during the very first Eton v Harrow cricket match at Lord’s in 1805. Byron fell in love with Mary Chaworth, whom he met while at school and refused to return to Harrow until January 1804 “He later wrote Childish Recollections about his Harrow friendships, He then attended Trinity College, Cambridge. where he met John Edleston for whom Byron composed Thyrza, a series of elegies. Had Byron had lived and gone on to defeat the Ottomans, he might have been declared King of Greece. Alfred, Lord Tennyson would later recall the shocked reaction in Britain when word was received of Byron’s death. Greeks mourned Lord Byron deeply, and he became a hero. The national poet of Greece, Dionysios Solomos, wrote a poem about the unexpected loss, named To the Death of Lord Byron and a suburb of Athens is called Vyronas in his honour. Byron’s body was embalmed, but the Greeks wanted some part of their hero to stay with them. According to some sources, his heart remained at Missolonghi.His other remains were sent to England for burial in Westminster Abbey, but the Abbey refused for reason of “questionable morality”.Huge crowds viewed his body as he lay in state for two days in London. He is buried at the Church of St. Mary Magdalene in Hucknall, Nottinghamshire. At her request, Ada Lovelace, the child he never knew, was buried next to him. In later years, the Abbey allowed a duplicate of a marble slab given by the King of Greece, which is laid directly above Byron’s grave. Byron’s friends raised the sum of 1,000 pounds to commission a statue of the writer; Thorvaldsen offered to sculpt it for that amount. However, for ten years after the statue was completed in 1834, most British institutions turned it down, and it remained in storage. The statue was refused by the British Museum, St. Paul’s Cathedral, Westminster Abbey and theNational Gallery.Trinity College, Cambridge, finally placed the statue of Byron in its library. In 1969, 145 years after Byron’s death, a memorial to him was finally placed in Westminster Abbey. Venetian painter Giovanni Antonio Canal (Canaletto) tragically died on 19th April 1768. He was born in Venice on 28th October 1697 and he painted many fantastic landscapes of Venice. He was also an important printmaker in etching. Canaletto served his apprenticeship with his father and his brother. He began in his father’s occupation, that of a theatrical scene painter. Canaletto was inspired by the Roman vedutista Giovanni Paolo Pannini, and started painting the daily life of the city and its people. After returning from Rome in 1719, he began painting in his topographical style. His first known signed and dated work is Architectural Capriccio. Much of Canaletto’s early artwork was painted “from nature”, differing from the then customary practice of completing paintings in the studio. in 1746 Canaletto moved to London and remained in England until 1755, producing views of London (including the new Westminster Bridge) and of his patrons’ castles and houses. His 1754 painting of Old Walton Bridge includes an image of Canaletto himself. After his return to Venice, Canaletto was elected to the Venetian Academy in 1763 and during his later years he often worked from old sketches, & sometimes produced surprising new compositions. He was also willing to make subtle alternations to topography for artistic effect & continued to paint until his death.